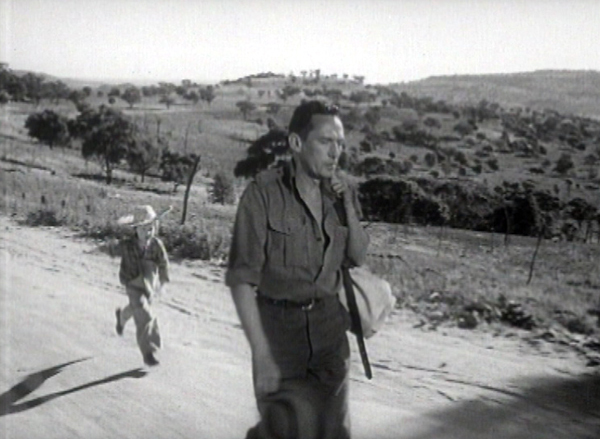 A scene from the movie, the Shiralee; filmed in Scone, 1956. At least 60 crew members arrived in Scone on September 6, 1956 to shoot at locations in Gundy and in Bunnan at The Cuan and Wooton. Mayor Mark Cotter held a civic reception in Elizabeth Park the following day, with director Leslie Norman and stars of the film Peter Finch, Rosemary Harris and Dana Wilson. Hundreds of people attended and Peter Finch signed every autograph book given to him.2 The reception was broadcast over 2NM Radio. Many local people were extras in the film including Frank Roser driving his car in Gundy, Bill Pinkerton driving a horse and sulky, David, Brian and Lionel Pinkerton with Bernard and Heather Fogarty played bat and ball, Terry O’Brien instructed Rosemary Harris how to ride and also had a small speaking part ordering the character Macauley to get back to work in the shearing shed and Jack Bartlett drove a semi-trailer with Macauley and Buster as passengers, loaded with sheep up Wooton hill. The property The Cuan was called Ednoola in the film and the village of Gundy became known as Coollomooloo. The Scone Advocate published a special supplement The Coollomooloo Star. While exterior locations were filmed locally, all interior shots were filmed at MGM’s studios in London. The property was filmed was mainly The Cuan with shots at Wooton being scenes along the road and down the drive. “…a screening of The Shiralee in Scone would need to be an Australasian premiere in order to invest it with maximum news value, thereby immeasurably enhancing its fund-raising potential…I would be prepared to make the film available for such a premiere in Scone, provided that the occasion was the means of raising a very substantial sum of money for the Scone War Memorial Swimming Pool Fund. …unless the premiere, by virtue of generous donation by invitees, was instrumental in raising several thousands of pounds for your fund, the event would not have any real significance. I assume…an important proportion of the seating accommodation in the theatre would be reserved for invitees making generous contributions to the funds…so that the amount raised would be far greater than it is were derived from paid admissions. If organised along the lines suggested, I feel The Shiralee premiere would constitute a social event which allied with district-wide celebrations would warrant coverage by the metropolitan press and national magazines and also by newsreel and television services with resultant publicity of unprecedented value to the Municipality of Scone. The premiere was held on Friday, August 16, 1957 at the Civic Theatre in Scone. 6:30pm – Cocktail party at Belmore Hotel. Local residents with reserved seat tickets and visiting film, radio, newsreel and newspaper personalities will be entertained. 7:45pm – Premiere procession will assemble at Elizabeth Park and proceed to the Civic Theatre. 8:15pm – The Mayor, M.R.Cotter, Shire President, W.A.Bishop and President of Rotary M.Boniface will receive the visiting personalities.. The Premiere raised approximately £6,000 for the swimming pool fund. The author of the book, D’Arcy Niland was born in Glen Innes and worked for a short time as a shed hand at Grampion Hills, Bunnan. the Scone and Upper Hunter Historical Society for their assistance, especially Mary Woodlands for her knowledge of local filming.